Growing up I devoured sports books like candy. It’s what kept me reading. Nowadays I find myself into a wide variety of books, but when summer or fall approaches I get the urge to immerse myself in another thrilling sport’s story. 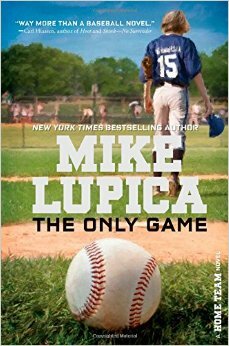 Mike Lupica is one of my go to authors for this purpose and his newest, THE ONLY GAME, arrived just in time. The story is about dealing with a tragedy, quitting something you love because of that tragedy, but then finding new friends who understand and help. Our protagonist, Jack, has much to worry with the choices he feels he must make. It’s not your typical book about baseball though there are numerous games played. I’ve known kids who have lost a close sibling, and its a tough road to travel for each of them. It does take time and though parts of this novel are predictable, I enjoyed this tale enough to feature it today. FULL PLOT (From Amazon): Jack Callahan is the star of his baseball team and sixth grade is supposed to be his year. Undefeated season. Records shattered. Little League World Series. The works. That is, until he up and quits. Jack’s parents are supportive and understanding. They are both there for him in different ways and together they make a super family. You’d love to have them as neighbors. Cassie, Jack’s new friend, is a feisty and strong female character. It’s understood by everyone that she is a leader and you’d best listen to her advice. No early romance here but their friendship strengthens as the story unfolds. Too often baseball books are formula written with a team playing through a season to win a championship. The addition of Jack’s struggles to regain his past and his drive to help another new friend, Teddy, The Only Game takes a much different path. The coach reminded me of many of the fine coaches you see and hear each summer in the Little League World Series. There’s a trick to motivating 12-year-olds and these gifted coaches always seem to have the right words. This becomes the first book in Mike Lupica’s new series called A HOME TEAM. I am looking forward to whatever this brings forth whether it be the same characters we’ve met here or new ones. FAVORITE LINES: He knew how much he was going to miss baseball. He was missing it already, just watching the Red Sox play the Orioles on television. Now he wondered how much he was going to have to miss his best friend, too. But maybe you could get better at missing things–and people–with enough practice. No Quote from the author this week as most were too long. You may be interested in Mike’s author page where you can see the wide variety of MG related sport’s books he has written. This entry was posted in Reviews and tagged Marvelous Middle Grade Monday, MG book reviews, Middle grade, Mike Lupica, The Only Game. Bookmark the permalink. That’s an awesome tradition to read a sport book in Spring. I loved the quote you chose. It so applies to life. Thanks for sharing this one. It sounds like a fun read for summer. Yes, great quote and there are many others throughout the book. Thanks for always stopping by! I checked THE ONLY GAME out of my library the other day (audio book version) and I’m looking forward to it! Good time to publish a book on baseball. But, I do like the shift in the book after Jack loses his brother. I think this book is much needed as it mirrors reality. Jack needs time to find his way back and I like the friends who support him! Excellent review. Yes, a really good baseball book and the shift is what kept it unique. Thanks for stopping by. How did I miss this one? I love Mike Lupica’s books and you know I love baseball. This sounds like a really special book. I’m going to get hold of a copy. Thanks for this post. Yes, both you and your grandson would enjoy this one. It has a great cover, too. Mike Lupica is a favorite in our family. We have all of his books. I started to say that I’m no into sports books, then realized I may have never read one. This one sounds like a good one to give a try, because it’s got more to keep my interest if the sports get boring. Adding it to be TBR pile! I don’t read a lot of sports books, although I am a sucker for a good sports movie. But the friendship angle sounds really intriguing–and spring is a great time for a baseball book! I’m not into sports at all, but this sounds like a really good book, in that it goes beyond sports to a deeper issue. Thanks for a good review that whets my interest.